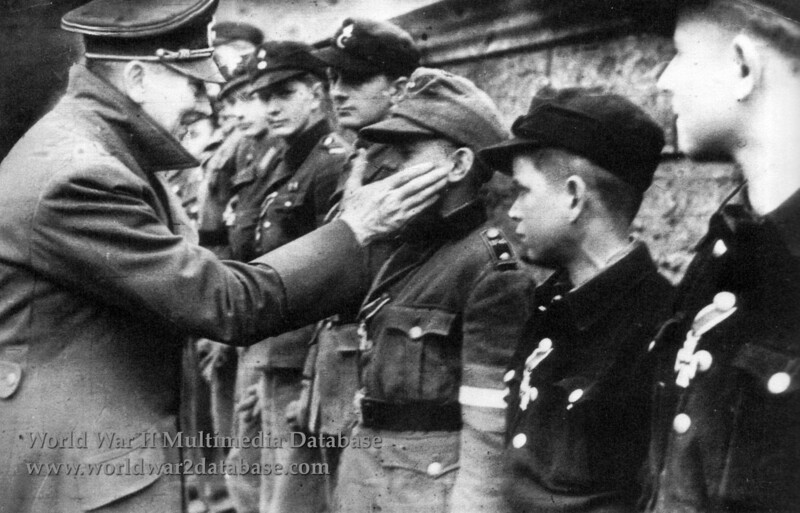 Fuhrer und Reichskanzler ("Leader and Reich Chancellor") Adolf Hitler (April 20, 1889 - April 30, 1945) touches the face of Wilhelm "Willi" Hubner (1929-April 12, 2010) a Hitlerjugend ("Hitler Youth") during an awards ceremony behind the Reich Chancellery on March 20, 1945. This view was taken from Die Deutsche Wochenschau Nummer 755 ("The German Weekly Review" Number 755), which was the last newsreel circulated to non-occupied Germany in March 1945. To Hubner's left is Alfred Czech. To his right, two persons down, is Erwin Scheidewig. Reichjugendfuhrer "Reich Youth Leader") Artur Axmann had just presented twenty Hitler Youth with the Eisernes Kreuz ("Iron Cross") Second Class. Hubner was first decorated by Reich Minister of Propaganda Joseph P. Goebbels (October 29, 1897 - May 1, 1945) in Lauban, a German city retaken by the Nazis on March 6, 1945. Hubner was a messenger attached to the Fuhrer-Grenadier-Division and was decorated for bravery under fire in the city square on March 9. Hubner was flown to Berlin, given a new uniform, and after waiting a short time, was redecorated by Axmann. Hitler never actually awarded the medals. The scene was photographed and Hubner was compelled to tell his story for the cameras. Hubner told his story, probably heavily edited, for the cameras: "When the Russians were closing in on Lauban, I reported for voluntary duty as a messinger to the combat commander. My job was to take dispatches to the individual command posts. I also frequently took provisions and panzerfausts (literally "tank fists" a disposable anti-tank weapon) up to the front line under fire. I carried the panzerfausts in a wheel barrow under enemy fire." The son of a farmer in Goldenau, Silesia, Czech made two trips under fire with his father's horse cart rescue wounded German soldiers. He first brought out eight, then four soldiers. The next day, while hiding in their home, a General ordered Czech to fly to Berlin to meet Hitler. Arriving in Berlin, Czech could hear the Soviet artillery outside the city, which was not yet in range. Hubner and Czech and eighteen others were given a large breakfast and put on clean uniforms. They lined up outside the Chancellery's back wall in the garden. While they waited for Hitler, Axmann told them to be at ease and to not greet the Fuhrer with the Nazi salute. Axmann pinned the Iron Crosses on the Hitler Youth. Czech remembered his conversation with Hitler as "So you are the youngest of all? Weren't you afraid when you rescued the soldiers?". Czech responded "No, my Führer!" Decades later, Czech stated ""Even at [age] twelve, I was an enthusiastic supporter of Hitler," After the ceremony, the Hitler Youth lunched with Hitler in the Fuhrerbunker, and told him their combat stories. Hitler was especially pleased with Hubner's story, as it reminded him of his own time as a messenger during World War I. The Hitler Youth were given one wish before returning to combat; Czech asked for and received an accordion. He could not return to Goldenau; the Red Army had occupied it. Czech was sent to German-occupied Sudetenland in Czechoslovakia and was shot in the lung. When he recuperated and returned to Goldenau, he found that his father was drafted into the Volkssturm ("People's Storm" the German Home Guard) and had gone missing during combat. His body was found in July 1945 with a bullet in his neck. Czech threw away his Iron Cross because of the taunting he received from Red Army occupation soldiers and Polish nationals. His sister was forced by the Soviets to consume the photo of Czech and Hitler that was hung over the family's mantlepiece. Germans were being expelled from Silesia and forced to move West. Czech was famous in his town as the Hitler Youth. Working as a miner while filing applications to emigrate to West Germany, he was finally allowed to leave when he joined the Communist Party. There he reacquired an Iron Cross and another copy of the photo for his living room. Hubner appeared in several documentaries after the war about the Hitler Youth, including "V Was for Victory" and "The World at War." He appeared with Erwin Scheideweg in a Netherlands Television documentary called "Die Hitlerjugend" in 1973. Nothing further is known about Erwin Scheideweg. Armin Lehmann (May 23, 1928 – October 10, 2008) often said to be standing with Hubner and Czech, wasn't present on March 20, 1945, but was decorated on Hitler's birthday on April 20, 1945 in an undocumented ceremony outside the Fuhrerbunker in the Chancellery garden.